Fans can join three top drum corps for a change of venue and a whole lot of fun on Sunday, July 13, when the Cadets, Glassmen and Teal Sound take to the streets of Disney World's Magic Kingdom for a very special day of performances! 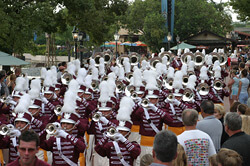 Drum corps fans will find an abundance of spectacle and excitement as these corps march through the "Happiest Place on Earth," the Walt Disney World Resort in Orlando, Fla. The Magic Kingdom corps performances will take place following the DCI Orlando Premier Event scheduled for Saturday, July 12 at 7 p.m. The Orlando Citrus Bowl, four-time home to the DCI World Championships, will play host that night to the performances of 10 top corps. Disney has a long tradition of recognizing the great performances of drum corps, bringing corps members' talents to the thousands who walk through the Walt Disney World Resort each day. The Cadets, Glassmen and Teal Sound will celebrate the joy of marching music and show their stuff when they march in front of Cinderella Castle at 2:30 p.m., prior to the park's "Dreams Come True Parade." Make this unique showcase of Marching Music's Major League in Disney World the perfect finish to a weekend, with the DCI Orlando event on Saturday the 12th, and Disney's special drum corps feature on the 13th! Fans can get tickets to Walt Disney World parks, including the Magic Kingdom, at DisneyWorld.com.